For All Skin Types - Restores, revitalises and rehydrates while you sleep. Bursting with organic rose geranium essential oil and intensive natural moisturisers, the cream lovingly restores skin so you wake up to smooth, supple skin and a healthy-looking, more radiant complexion. Restores and revitalises all skin types. Enriched with organic rose geranium essential oil in a specially formulated cream that creates smoother, supple skin. 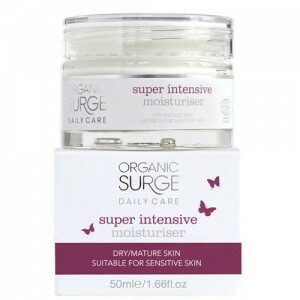 Organic Surge cares about your skin and wants to help you to look and feel your natural best everyday. Their products are made from naturally-derived, skin-loving ingredients and certified organic essential oils. Many are now certified organic with Ecocert too. Organic Surge products contain no obscure or harsh chemicals for your precious skin to absorb and the natural fragrances smell delicious too! Green Tea, Shea Butter, Aloe Vera. Aqua (Water), Aloe Barbadensis Leaf Juice*, Glycerin, Cetearyl Alcohol, Theobroma Cacao (Cocoa) Seed Butter*, Butyrospermum Parkii (Shea) Butter*, Glyceryl Stearate SE, Stearic Acid, Simmondsia Chinensis (Jojoba) Seed Oil*, Vitis Vinifera (Grape) Seed Oil*, Isopropyl Myristate, Benzyl Alcohol, Sodium Stearoyl Glutamate, Lavandula Angustifolia (Lavender) Oil, Linalool, Tocopherol, Dehydroacetic Acid, Camellia Sinensis Leaf Extract, Chamomilla Recutita (Matricaria) Flower Extract, Potassium Sorbate, Sodium Benzoate, Limonene *ingredient from organic farming. Naturally occurring within essential oils. Product colour or texture may vary slightly due to natural ingredients. Store in a cool dry place, out of direct sunlight. Dab a small amount onto the tips of your fingers and work the cream into your face in a circular motion. Use nightly for optimum effect and smoother skin. Apply after cleansing with Organic Surge Face Wash.